The MallinCam latest generation are Full Featured Advanced Astronomical Observational Video CCD Cameras. Their features are described in more detail in the Products section. 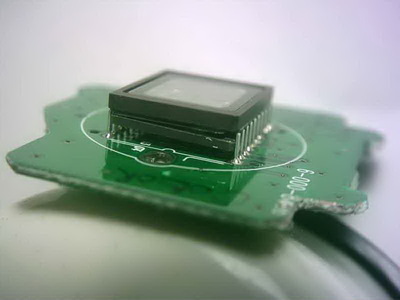 Our cameras are made using only Class 1 or 0 CCD sensors, and Grade 1 electronic components throughout. 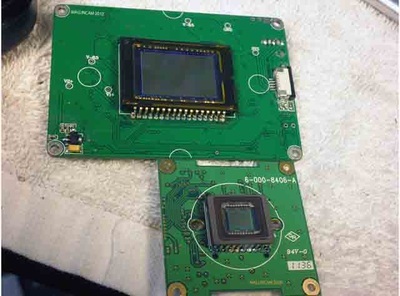 Our higher end cameras contain a unique custom manufactured high gain circuit ("Hyper Circuit") not found in any competitor video CCD camera. 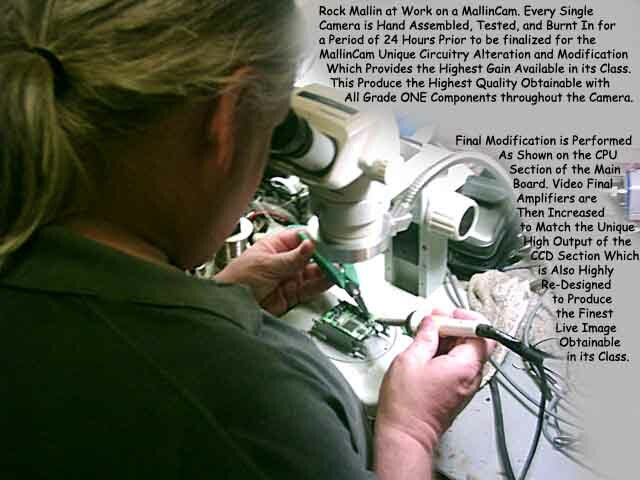 All MallinCams are hand crafted one at a time, making MallinCam the most high performing and reliable camera available anywhere. They are in a class of their own! 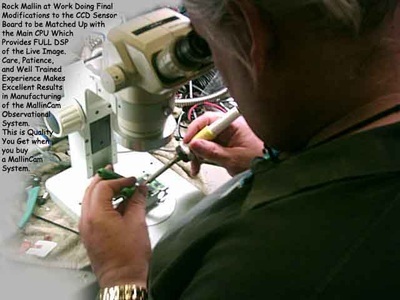 Below are some images that document various aspects of the design and manufacture of our cameras. 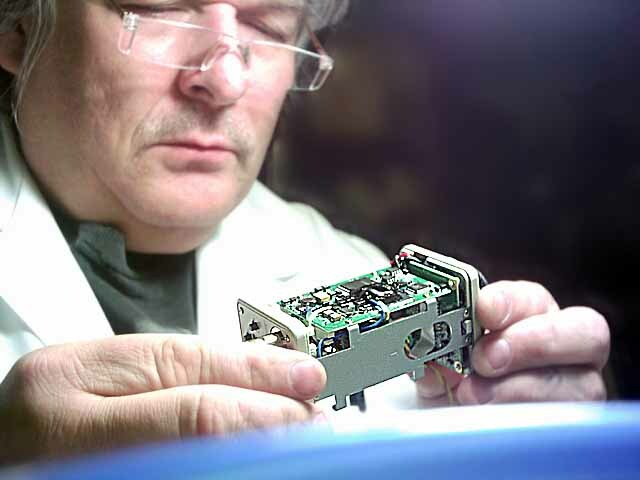 If you are interested in learning more about what is involved in the design of an astro-video camera, please read the white paper: "What's In an Astro-Video Camera? ", by Jim Thompson. 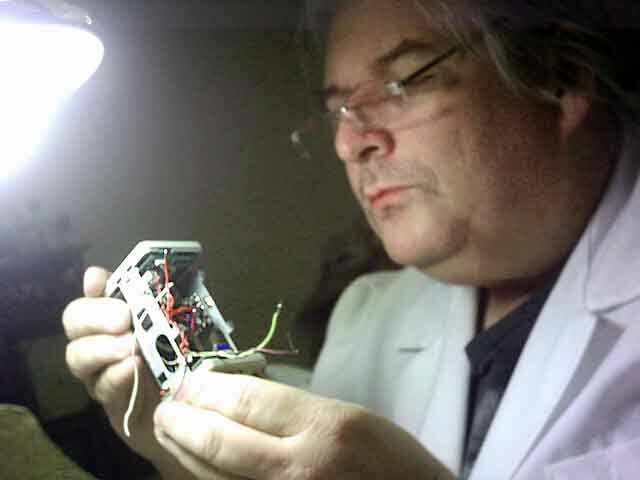 Our Peltier design is unique in the industry. 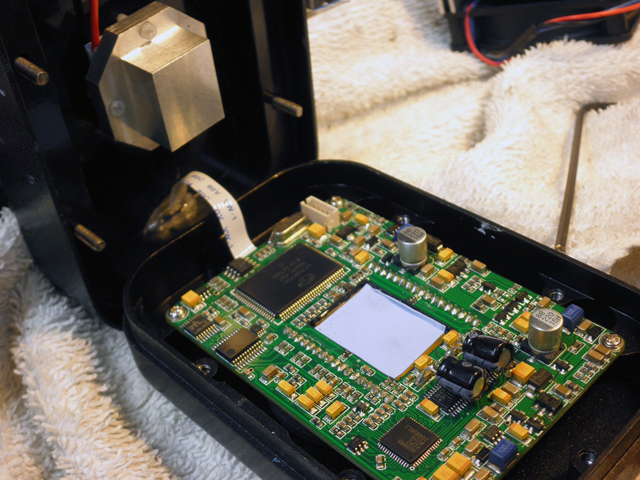 Our custom made Peltier Coolers are not the same as others used in video CCD camera and CCD imagers. Operating at the same voltage, the image above clearly shows the left Peltier being a standard one is not as cold as the MallinCam Peltier device. 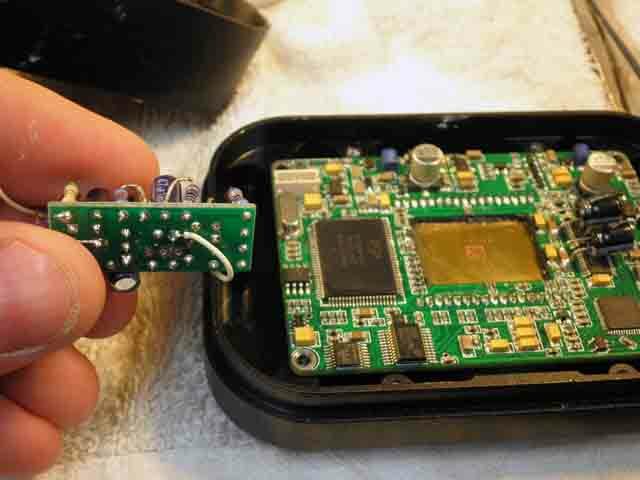 The Peltier on the right is frozen solid showing the effectiveness of our Peltier device at the same voltage. 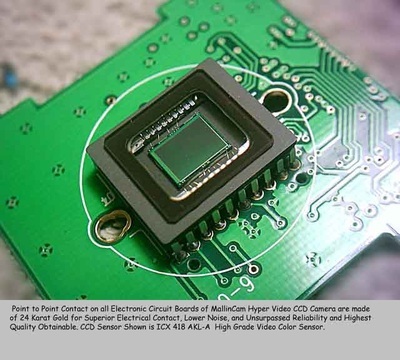 The result is a lower current consumption for the right amount of cooling necessary to SAFELY cool the video CCD sensor used in all MallinCam. Efficiency and low current draw means a safer and longer running camera all night long without killing your batteries in the field. The images above show our Peltier Cooler generating a difference of 47 degrees Celsius below the room ambient of 26 degrees C on the test bench. Our MallinCam Peltier Coolers are the finest available anywhere on the market in any cameras. Many camera manufacturers use dual Peltier coolers even up to 3 Peltier coolers in their video CCD cameras to get a marginal cooling. Our MallinCam Peltier Cooler does better than dual Peltier using only one efficient cooler custom made for our cameras and CCD sensor. Using the same voltage under same operating conditions, the left Peltier clearly lacking proper cooling. 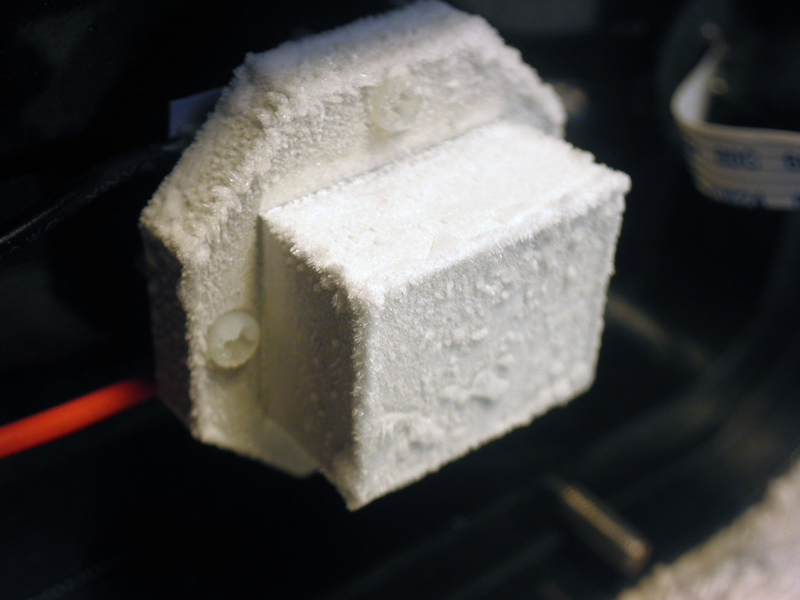 Condensation is visible on the surface of the standard Peltier cooler. On the right, the MallinCam Peltier Cooler is clearly cooler using the same voltage and conditions as the left one. 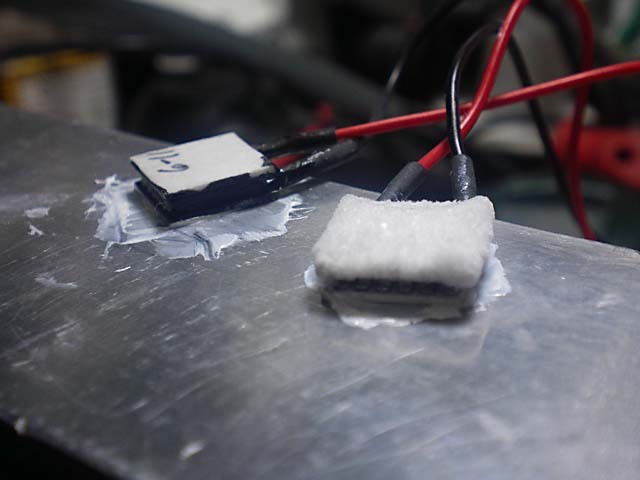 Result is solid ice condition which offers a more efficient cooling at a lower voltage and using less current draw as normal peltier coolers would. This mean a better efficient cooling under all operating condition using up to 60% less power than a normal Peltier cooler. 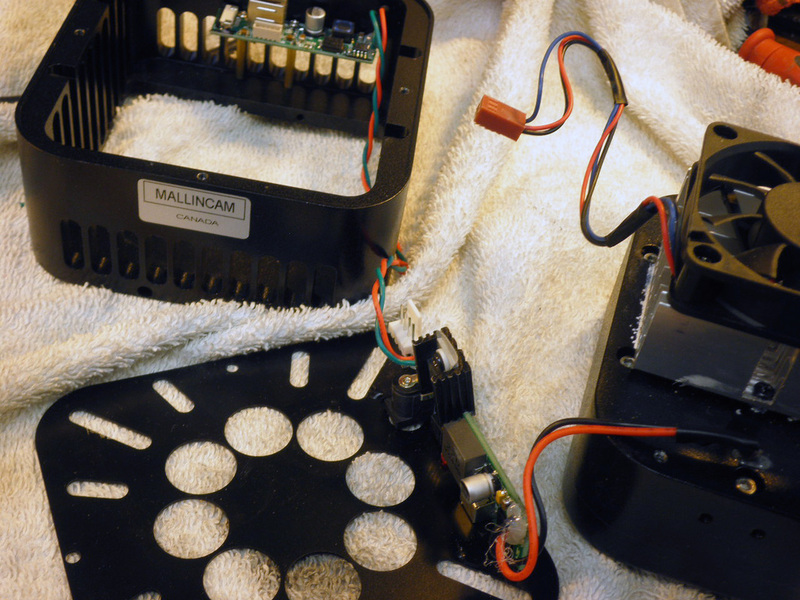 MallinCam ThermoElectric Cooler Systems are truly the finest available on the market today. Our cooled MallinCams use a fully regulated Thermoelectric Cooling System (TEC) that is unique in the industry. Equipped with AutoSafe Thermal Shutdown (TM), the CCD Sensor will safely perform with minimal thermal noise. Our Peltier Coolers are custom manufactured for our cameras. A special digital regulated Peltier driver is standard with all cooled MallinCam models. (Patented) The end result is an image with much less noise than other cameras on the market. 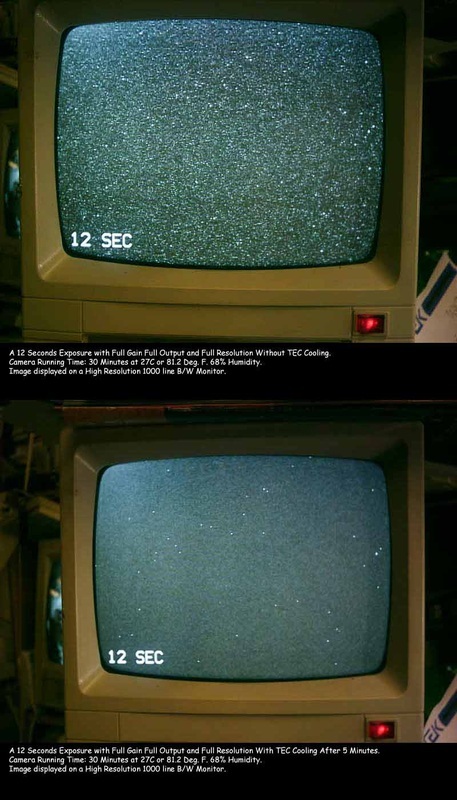 The GIF animation above is of a video CCD sensor going through a thermal shock while observing Stephan's Quintet through a telescope being DEEP COOLED. Beware of other brands claiming their Peltier coolers are better. 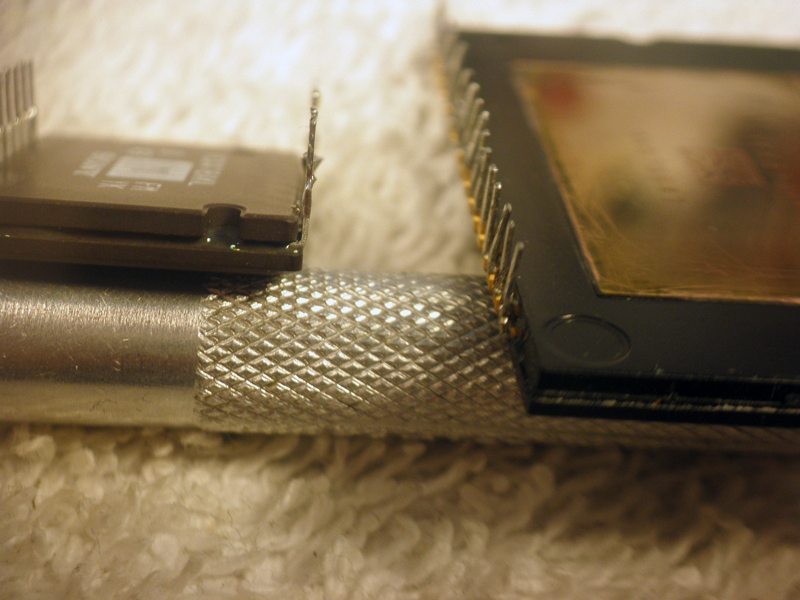 The truth is video CCD sensors are not intended to be DEEP COOLED. MallinCam designed mild cooling will assure long life, durability and dependability with the finest live image obtainable in the industry. BEWARE OF IMITATORS. THERE IS ONLY ONE MALLINCAM UNIVERSE! READ HOW ITS MADE. . . 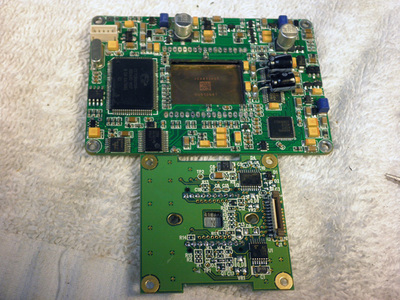 The picture on the left (above) shows the separated circuit boards for the Peltier driver and USB circuits, requied to be set into a separate chamber to avoid noise into the CCD chamber side of the camera; a MallinCam design. The middle picture (above) shows the shielded section of the main circuit for the CCD sensor along with the advanced Peltier cooler system with maximum heat pump effect directed at the rear part of the CCD sensor. This is a MallinCam design not found on any others on the market. 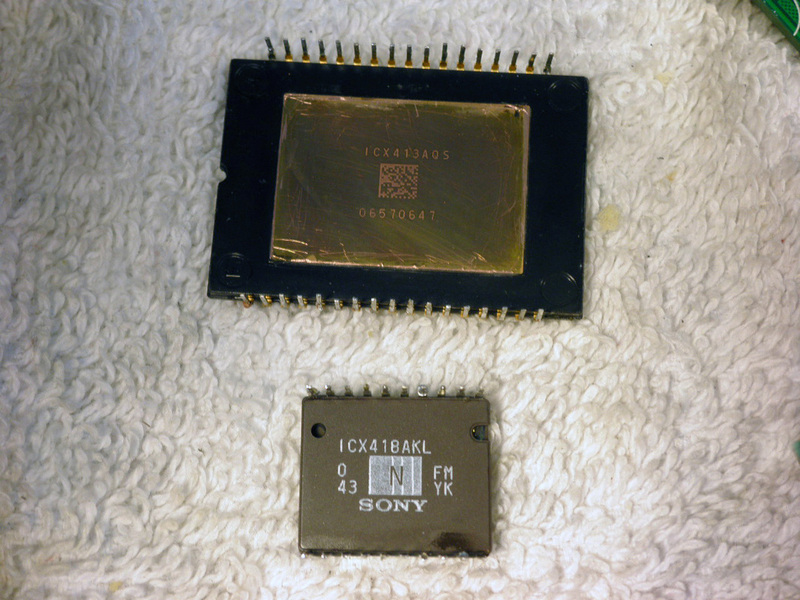 The picture on the right (above) shows the unique Hyper Circuit being installed inside the rear section of the main board. This is also a feature unique to MallinCam cameras. 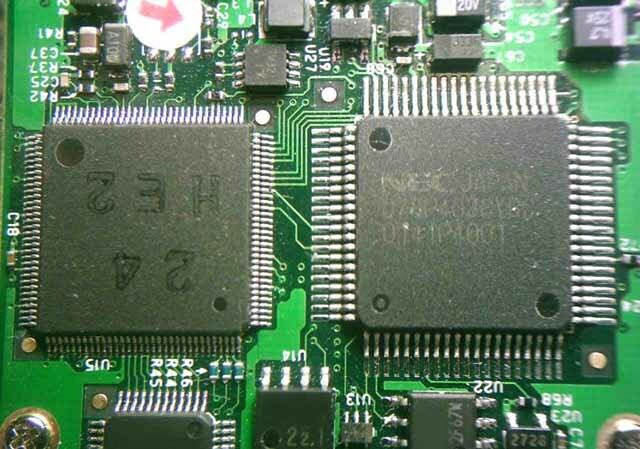 The same similar Hyper Circuit is found on all MallinCam MCHP, VSS, VSS+, XTREME and X2 cameras. Only the MallinCam has this unique circuit to allow full automatic control of CCD sensor bias, exposure control, and amplifiers among other required functions for high performance imaging. 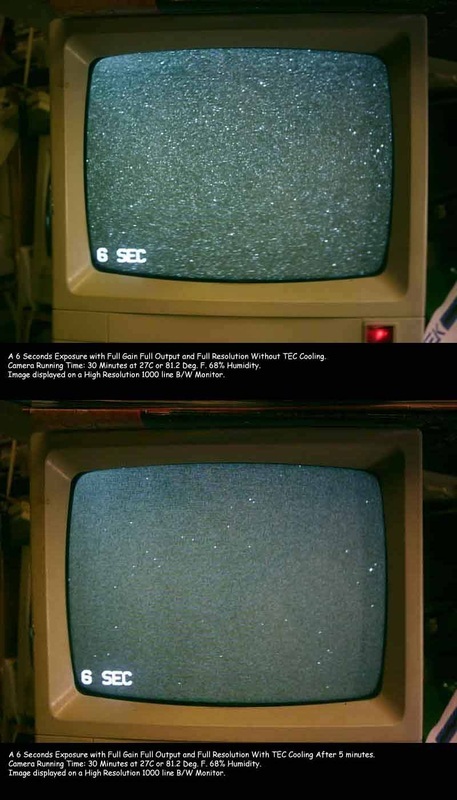 The pictures above show the difference in size between the CCD sensors found on the MallinCam Universe (larger) and MallinCam MCHP, VSS, VSS+, XTREME and X2. Note however that both CCD circuit boards have windows through the backside of the board to allow for the easy application of thermoelectric cooling. The CCD chip itself from the MallinCam Universe has a metal rear mounting that is 0.1mm higher than the surrounding package. This offset allows for superior contact with the cooling system's cold finger. The metal copper plate is molded into the thermal plastic chip package, providing a direct path for heat to be conducted away from the CCD sensor. This is a feature not found on most other cameras on the market today. The picture above shows the Peltier cooler system from the Universe applied directly to the end of the machined aluminum cold finger. 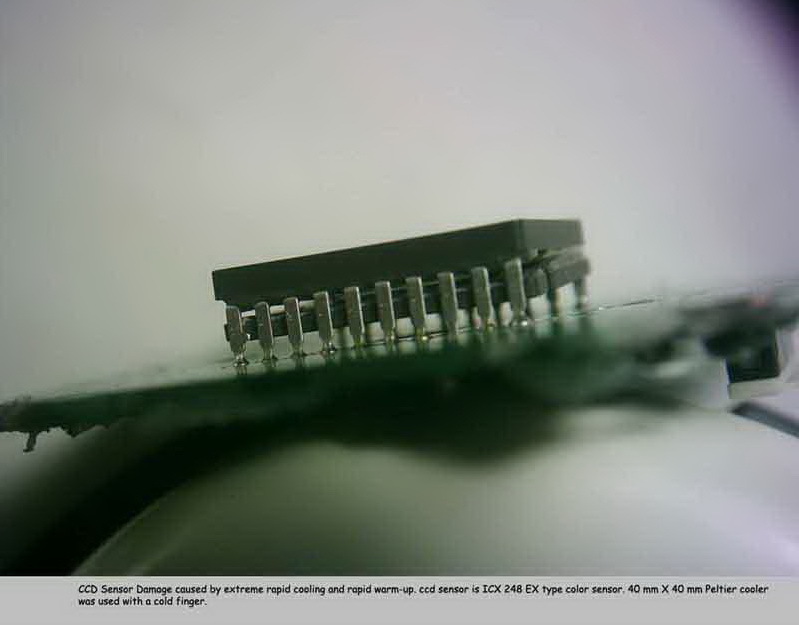 When the camera is fully assembled this finger presses firmly against the metallic backside of the CCD chip, efficiently conducting away heat. Sitting in open air, the Peltier is able to drop the finger's temperature to 45degC BELOW ambient. This is evidenced by the quick buildup of frost on the finger shown in the image above. MallinCam Universe has a Class 0 Scientific grade CCD sensor as standard equipment. There is only one MallinCam Universe!